If bad foot hygiene has left you embarrassed on more than one occasion, then it’s time for you to learn how to maintain proper foot hygiene. Bad foot hygiene is a deterrent of good health as well as good company. Everybody’s bodily tendencies are different. Those who tend to sweat more face more problems in maintaining foot hygiene. But everybody needs to have a regular foot cleaning regime, as sometimes the regular shower or bath doesn’t cut it. With so many body parts that need your and your soap’s attention, feet more often than not shift out of focus. What you can do is create a separate foot hygiene regime, where the sole focus is on your feet. You don’t need to go for all-out pedicures, but a thorough cleaning and moisturizing should be done regularly. If you cannot squeeze it into your schedule daily, do it at least twice a week with toenail care thrown in weekly. Your feet support your entire weight day in and day out, without much complaining. Return the favor and show your feet some TLC. Fill a tub or a basin with lukewarm water. 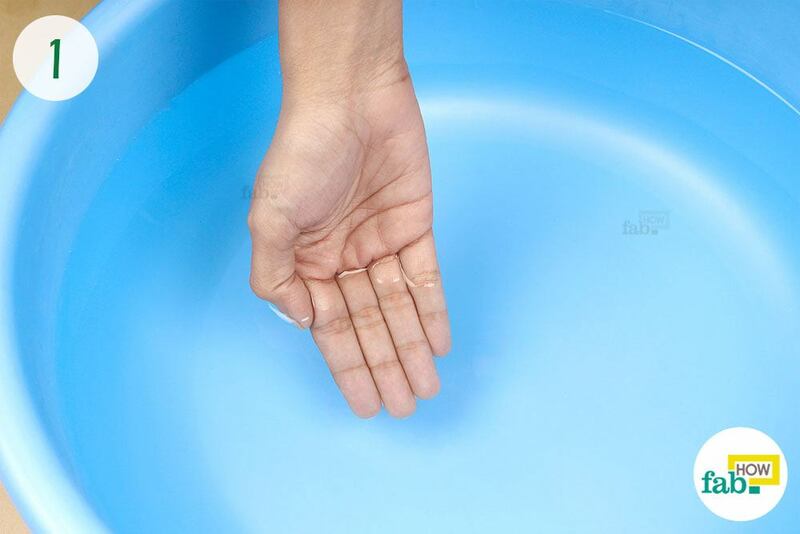 Dip your hand in the water to test the temperature. The water should feel comfortably warm on your skin rather than scalding hot or extremely cold. Also, the tub should be big enough to easily accommodate both your feet with some room to spare. Squirt some body wash into the water. Swirl it into the water to form bubbles. It will help to clean your feet thoroughly, removing dirt and other external impurities. Sit comfortably in a chair and place your feet inside the tub. Soak your feet for 5 to 10 minutes. Listen to music or relax in the meantime. Soaking helps soften the tough skin on your feet, especially that of the soles and the heels. It also prepares your feet so that they can withstand the subsequent scrubbing and exfoliation without any harm. For cleaning your feet, you may use your hands or even a loofah. Give the entire area of your feet a gentle cleaning. Be sure to clean between the toes, as that’s the usual breeding ground for bacteria and fungi. 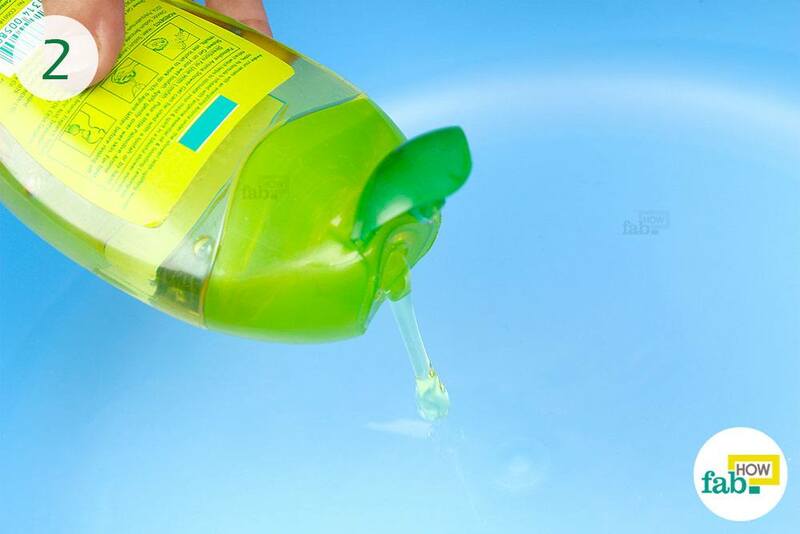 With regular cleaning, you can easily fend off any infection. Pay attention to the arch of your feet, and under and around the toenails as well. Keeping the area surrounding your toenails clean can easily deter any potential toenail infections. After cleaning, grab a pumice stone to exfoliate your feet. If you don’t own a pumice stone, you can easily get it at your nearest beauty store. Gently scrub your heels, the arches and the balls of your feet with the pumice stone. This will remove the layer of dead skin cells. Be sure not to be harsh on your skin. Take a steady rather than a speedy approach. Applying too much force while exfoliating may result in production of more dead cells in the area as a protective reaction by the body. With a clean and dry towel, pat your feet dry instead of wiping. Dry the entire area of your feet completely as moisture accelerates bacterial growth. Again, pay special attention to the area between the toes and dry it completely. Footbaths make your toenails soft, and hence easier to deal with. Grab the opportunity to trim your toenails with a toenail clipper. Always cut the toenails straight across to prevent ingrown nails. Take care not to cut too close. Smooth any pointed edges with a nail file working in a single direction. Nails should be trimmed weekly or so to maintain overall hygiene, as unkempt and long nails collect dirt and grime beneath them and harbor germs. Massage your favorite moisturizer into the skin. Cover the entire area of your feet, except the space between your toes as you need to keep that area as dry as possible. Moisturizing is an important step. Cleaning your feet with a footbath softens them and moisturizing helps keep them that way. This step is most beneficial for people with cracked heels. Doing this daily or at least twice a week should significantly improve your foot hygiene. You can also scrub and exfoliate your feet when you take a shower or bath. About 5 to 10 minutes into the shower or bath, your feet should be fit for cleaning and exfoliation. You may also add Epsom salt or some drops of your favorite essential oil into the footbath. If the water gets dirty by the end of your footbath, discard it. 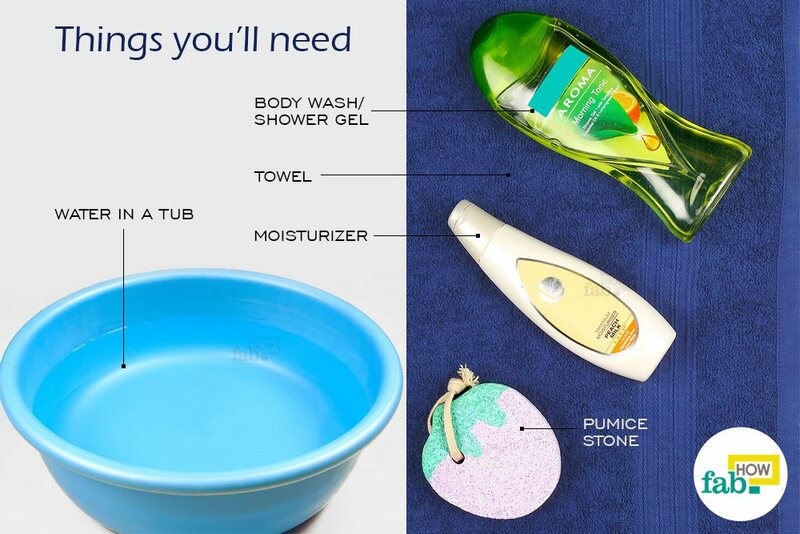 Wash your feet with fresh water before drying. Mop up any water that splashes out of the tub. Keep the floor dry to avoid any accidents, as wet feet and wet floors do not mix. Wear clean socks daily to improve your foot hygiene. Always wear clean socks after cleaning your feet. Air out, disinfect and deodorize your shoes regularly to limit bacteria and fungi exposure to your feet.